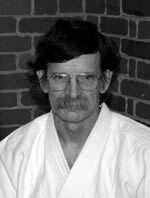 After training in Tae Kwon Do for several years, Brian Kelley began training in Aikido in 1980 at the Shodokan Dojo in Salem, Massachusetts with Bernie Mulligan sensei. He also trained at New England Aikikai in both Aikido and Iaido with Mitsunari Kanai sensei. In 1982 he moved to Virginia with his family. Because there was no Aikido dojo in the Elkton, Va. area, he made occasional trips to Capitol Aikikai in Washington, DC to train, and did this for several years. Kelley sensei holds the Shinshin Toitsu Aikido rank of Sandan and the Shinshin Toitsudo rank of Chuden. He is also a Qualified Assistant Examiner in Ki Aikido. See the website below for fee details.